Dubai (United Arab Emirates) – September 25, 2018 (travelindex) – Ethiopian Airlines, the largest Aviation Group in Africa and SKYTRAX certified Four Star Global Airline, is pleased to announce that it has been crowned “Best African Airline” at Arabian Travel Awards 2018, the second edition of Arabian Travel Awards, held on September 20, 2018 in Dubai. The winners of the award were determined based on the votes of travelers. Regarding the award, Mr. Tewolde GebreMariam, Group CEO of Ethiopian Airlines remarked, “We are honored to have been voted the ‘Best African Airline’ at the Arabian Travel Awards 2018, a testimony that our product and services are meeting the high expectations of customers from the Middle East. 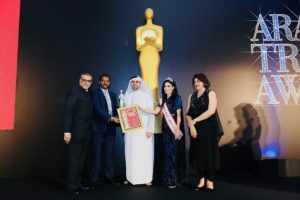 The Arabian Travel Awards recognize and encourage the talent in the travel, tourism and hospitality sectors under different categories such as Airlines, Cruise companies, Hotels, Travel Technology Providers, Travel Insurance Facilitators, B2B Travel Portals, Travel Agents, Tour Operators and Holiday companies, among others. Ethiopian is a multi-award winning airline registering an average growth of 25% in the past seven years. Ethiopian commands the lion’s share of the pan-African passenger and cargo network operating the youngest and most modern fleet to more than 116 international passenger and cargo destinations across five continents. Ethiopian fleet includes ultra-modern and environmentally friendly aircraft such as Airbus A350, Boeing 787-8, Boeing 787-9, Boeing 777-300ER, Boeing 777-200LR, Boeing 777-200 Freighter, Bombardier Q-400 double cabin with an average fleet age of five years. In fact, Ethiopian is the first airline in Africa to own and operate these aircraft. Ethiopian is currently implementing a 15-year strategic plan called Vision 2025 that will see it become the leading aviation group in Africa with Six business centers: Ethiopian International Services; Ethiopian Cargo & Logistics Services; Ethiopian MRO Services; Ethiopian Aviation Academy; Ethiopian ADD Hub Ground Services and Ethiopian Airports Services. Ethiopian is a multi-award winning airline registering an average growth of 25% in the past seven years.